Whilst Bracknell’s dated town centre is torn down and re-modelled there’s one modern joint catching the eye. Found amongst the boarded up buildings, but soon to be modern metropolis, is Blue’s Smokehouse. 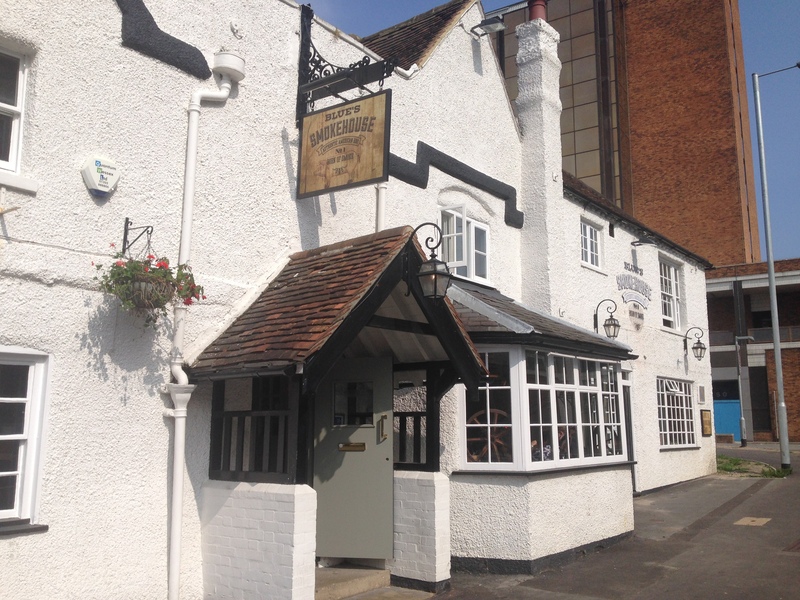 The Joint: Blue’s Smokehouse, High Street, Bracknell, Berks, RG12 1DS. How about you check out their website by clicking here. The Vibe: With the American football season kicking off this weekend it seemed like the ideal time to head out to a juicy BBQ joint, and Blue’s Smokehouse was the perfect fitting. The one time pub has been transformed into a fresh and vibrant Texas style BBQ pit, getting a clear jump of the wider town’s renovations. It’s relaxing and welcoming this Sunday lunch time and our big party (…a certain someone has just hit 30 years old) dined on half the menu between us. 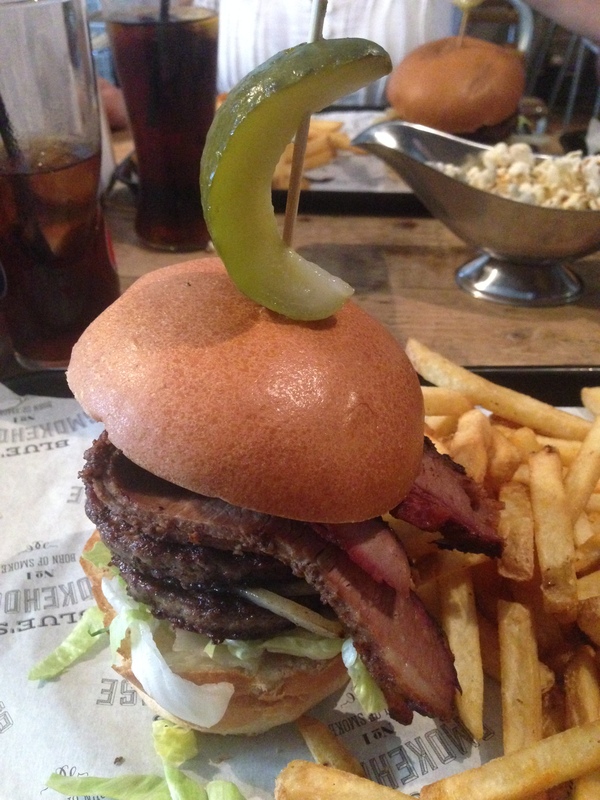 First up was the Brisket Combo Burger – the joint’s classic Smokehouse with added brisket stashed on top. There’s two burgers, generous slices of brisket cut beef, and mounds of available toppings. It’s rounded off with a gherkin on top too for added effect. It’s a gorgeous mouthful and goes down well with Blue’s home made cherry bourbon sauce. It wouldn’t be a true BBQ joint though without Burnt Ends and Blue’s doesn’t disappoint there. 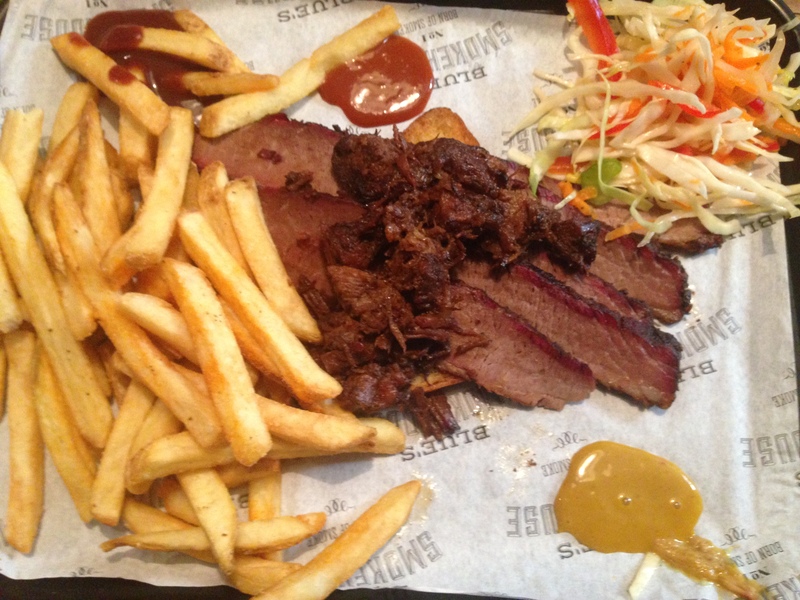 Their slow cooked hickory flavoured ‘ends are also served with brisket to make a mouth watering tray. It’s well matched with fries and ‘slaw too. With the birthday cake on the horizon we still had time to tuck into Blue’s Special Link Sausages. Two huge links of spicy sausage, a solid stack of crispy onions, and topped up with the same fries and coleslaw. 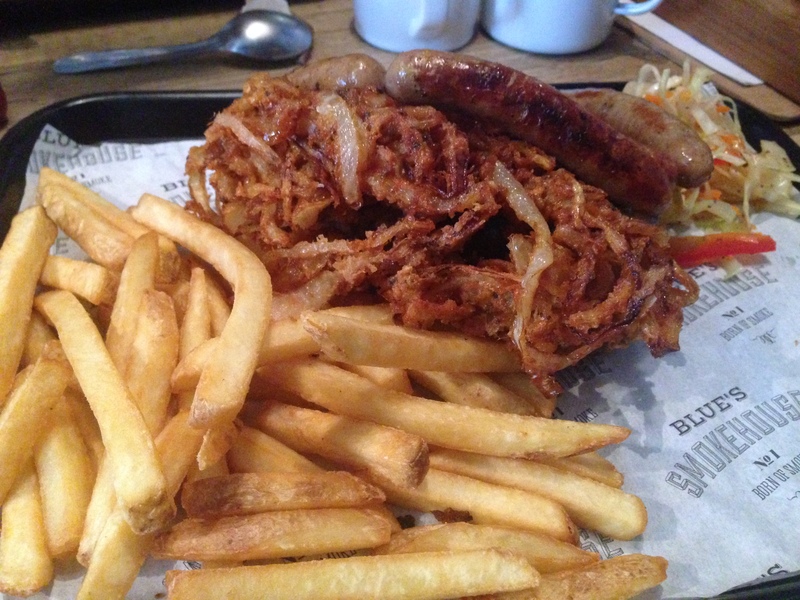 The picture definitely doesn’t do the dish justice – there are five more sausages hiding in the pile. We tried this with the joint’s home made Kansas tomato sauce, a touch lighter and a good compliment for the heat in the sausage. Blue’s Smokehouse are leading Bracknell’s renovations and they’re a great starting point for what’s to come. The Price: You’re looking at between £7 and £14 for a main course and a few pounds more for a side. Blue’s Smokehouse was visited by Tom is September 2014. Posted in EnglandTagged BBQ, berks, berkshire, blue's smokehouse, bracknell, brisket, burger, coleslaw, fries, gherkin, lunch, sausage, smokehouseBookmark the permalink.